Air Commodore Peter Malam ‘Pete’ Brothers CBE, DSO, DFC, and Bar (1917-2008) was one of the most heroic and highly praised pilots of the Second World War. Decorated extensively, he secured a total of 16 'kills' over the course of the conflict, with 10 of these occurring during the Battle of Britain. Pivotal moments in his career include the time, in August 1940, when his flight encountered around a hundred enemy aircraft, including Messerschmitt 110's; he led the flight in attack against them, and soon found himself in a stalled position, out of which he spun, only to be confronted by a Dornier 215, which he shot down, before later destroying a Messerschmitt 109. Scores of these kind of risky maneuvers and winning victories punctuated a career defined by great courage, leadership and initiative in the face of fierce opposition. This new and engaging biography profiles a pilot who, until now, hasn't been the subject of such a thorough book-length study. 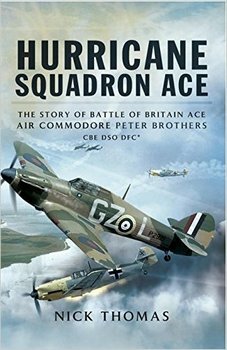 The story of his career is incredibly entertaining, featuring a number of hair-raising episodes, and is sure to appeal to fans of aviation history as well as the more general reader seeking out an action-packed biography offering fresh insights into one of the most pivotal conflicts of the twentieth century.